Be my guest on my radio show that is global! 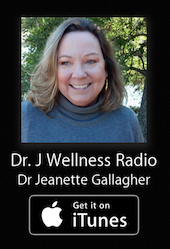 Welcome to Wellness Radio with Dr. J! Wellness Radio with Dr. J is a full spectrum wellness radio show which covers topics such as; spirituality, health, alternative medicine, dental health, green living, life changes, caregiving, patient advocate, end of life and many other conversations with experts. I am currently looking for people who would like to share their work, product, mission or purpose in life that others would be interested in who may not cross the path to find you in a brick and mortar business. Radio shows vary from 30 to 60 minutes to discuss in casual conversation a topic with me, Dr. Jeanette, as an informed host. Archived shows top 400, listeners top 500k, and we are on iTunes, Blog Talk Radio and Pyramid One Network. To discuss this option with me, visit my websites, any of the ones listed below, see which site and company/resources/product/blog would fit your business. Then, send me an email directly through that website on the contact us page. Do not worry about which page or blog entry, if after review with you I think another spot would be a better fit, we can do that too. I do believe it is important to share what is unique in each mission or business with others around the globe (yes, the show is heard by people around the globe, we are not local radio, we are heard everywhere). We do not live in a vacuum and people crave new ideas and love to share who they are with anyone who will listen. This is the time to share You with others on the radio. www.outoftheboxhealthcare.com: Restaurants, grocers, healthy products, food specialty items, health and wellness of body, mind and spirit, spirituality and life enhancement, medical/dental/alternative healthcare practitioners and professionals. www.mypersonaladvocate2.com: End of Life, healthcare challenges and medical crisis support, personal plans for quality of life. www.drjeanettegallagher.com: Dr. Jeanette Gallagher’s professional page which includes; books, events, recordings, writings, and personal guidance services if you are having life challenges.